My flickr site breaches the 5,000 visits mark. Thanks for small and big graces. When I picked up my first digital camera last year, I didn't know where it will lead me. Now I've got acquaintances from as far as Europe and the U.S. most of whom wouldn't be able to journey to the Philippines anytime soon. Hopefully, I can contribute to the effort of convincing them to try and have a taste of what this beautiful, albeit confused, country can offer. you got a point there emz! it's just that it often rains or is overcast most of the time dito. 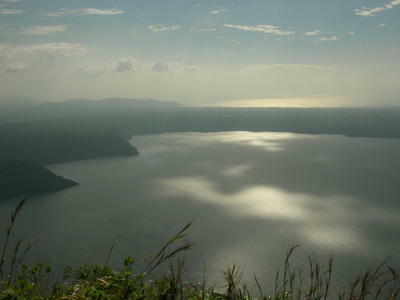 this shot of taal lake from maculot pa-sunset na nung bumaba kami. di lang namin na-resist, hehehe. thanks for dropping by! now thats just .. magical .. where is it?